Defatted sunflower seeds fed to cattle currently have more protein (35 percent) by weight than we get back from beef (26 percent), according to Planetarians, who saw an opportunity in this space. Defatted seeds are the dry matter that’s left after oil extraction from crops grown for their oil, such as sunflower, canola and cotton seeds. On average, 20 pounds of defatted seeds are created for every gallon of extracted oil. 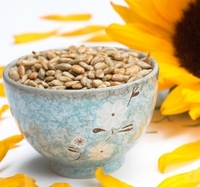 The world's supply of defatted sunflower seeds in 2017 was 19.02 million metric tons according to the USDA (5 percent of the feed grade protein meal market). Historically, defatted seeds have only been used in animal feed. 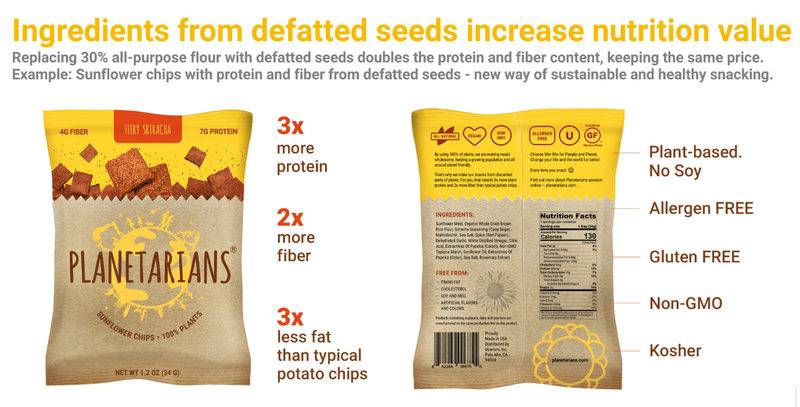 However, defatted sunflower seeds repurposed into human food can provide consumers with a cheap, clean, sustainable source of plant-based protein and add value to supplier profits. Repurposing defatted sunflower seeds from animal to human consumption unlocks a US$311 million added value market and a US$1 billion market by 2037, says the company. The discarded parts of plants may contain as much protein as beef or chicken breast. Oil-crop meal is the by-product of the oil extraction process, while the financial value of the seed lies in the extracted oil, the meal is considered an unwanted by-product. Meal from oil-crops is usually used as a livestock feed for ruminants, like cows. “Historically, defatted seeds have only been used in animal feed. However, defatted sunflower seeds repurposed into human food can provide consumers with an affordable, clean, sustainable source of plant-based protein and add value to supplier profits,” he explains. Planetarians have invented a method to repurpose defatted seeds, so they are available for human consumption and subsequently filed a patent for the new ingredient, SunMeal. SunMeal is a dry, flour-like ingredient with the neutral, pleasant taste of sunflower seeds. 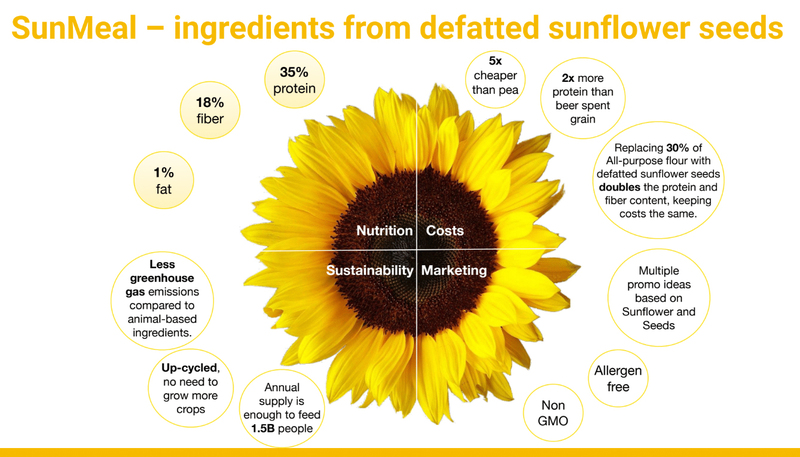 SunMeal – an ingredient from sunflower defatted seeds – is available in flour-like and crisps-like form with the neutral, pleasant taste of sunflower seeds. SunMeal has 35 percent plant-based protein, 18 percent fiber, and just 1 percent fat. Focusing on healthy snacks as the minimum viable product (MVP) for Planetarians, Manchuliantsau sees that food recycling and upcycling unlocks access to affordable, healthy meals for the world’s growing population. 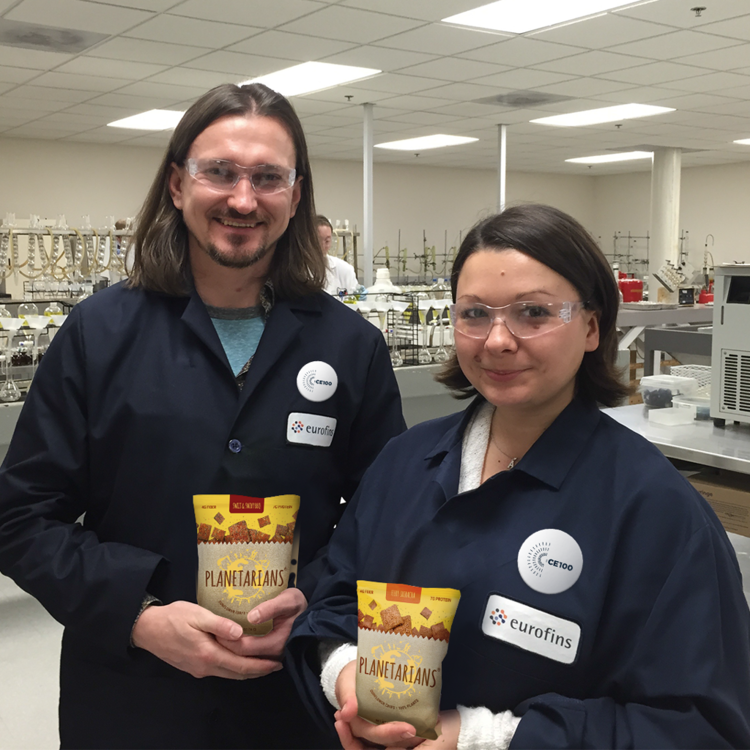 “So far, we have created a snack that was their first test of using the ingredient, Planetarians Sunflower Chips, which replace 30 percent all-purpose flour and fiber content, keeping the same price,” he notes. And the creation of their all-purpose flour is in process now, says Manchuliantsau. “Imagine making food ‘superfood,’ healthy fast food, cost-effective food. Our job is to make it real,” he adds. Planetarians’ manufacturing process was tested and optimized at the University of Minnesota. The resulting product was certified for nutritional content by General Mills Medallion Labs. Patent-pending applications for process, ingredient and formulations (filed in April 2017) prohibit competitors from using defatted seeds in any food product for human consumption.